I will be playing three solo pieces by notable women composers in history. This is the symphony’s season premier concert for the 2013-2014 season. It is called The Show Must Go On! The concert features Susan Egan, who is a Broadway star and Tony-nominated actress. I will be playing the piano in the orchestra. Enjoy selections from iconic musicals such as Cabaret, Chicago, Beauty and the Beast, Funny Girl and more. Tony Award nominated actress, Susan Egan, is known for her role as Kim in Bye, Bye Birdie, Meg in Hercules and Belle in Broadway’s original Beauty and the Beast. There will be no regularly scheduled private lessons on October 29, 30 and 31, as there are five Tuesdays, Wednesdays, and Thursdays. If you need make up lessons, you will be notified individually of your make up time. On October 8, four students will be performing for the Temecula City Council at the Council Chambers: Anna Stone, Fiona Harley, Alexa Willis, and Ron Lycan. This is a great opportunity for them and they will each receive a certificate signed by the Mayor! 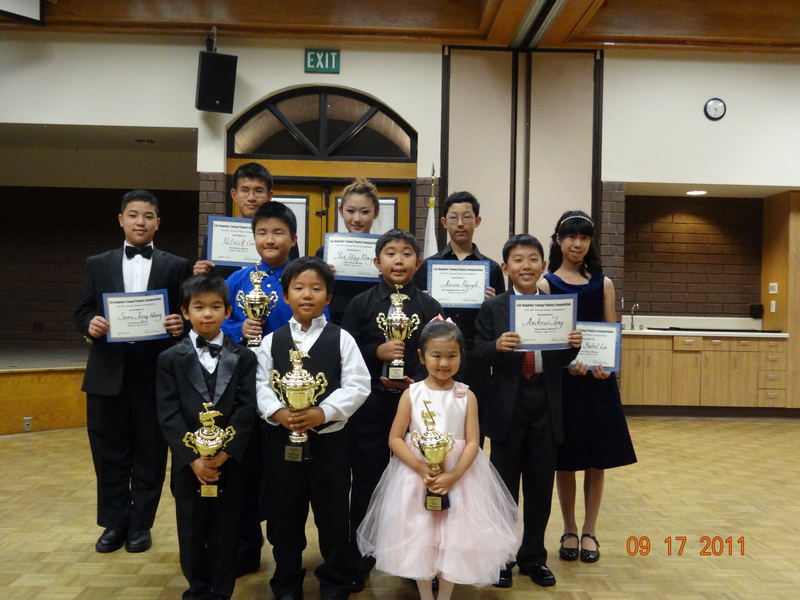 Jonathan Lee, David Huang, Sabine Moriyama, Calvin Han, Emily and Kristen Law, Charmaine, Chanelle and Cheryl Tan will perform at TVMTA Fall Costume Recital on October 19 at Temecula United Methodist Church. 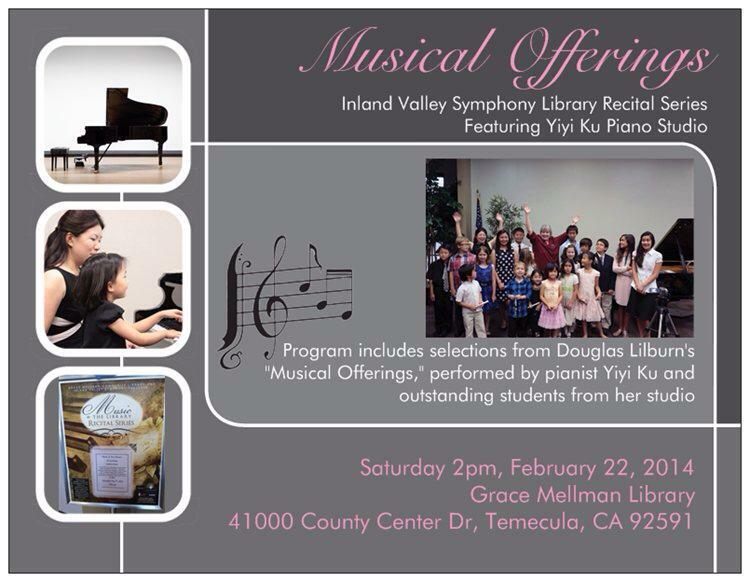 The recital will start at 2pm. 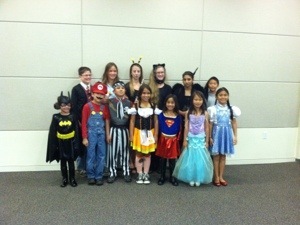 Shania Jin will perform at MTAC Halloween Recital on October 26 at Temecula Public Library on Pauba Road. The recital will start at 12:15pm. Every month, I would like to showcase one student from the studio. The featured student this month is Ron M. Lycan II. Ron is nine years old and a fifth grader at Southshore Elementary School in Menifee. Ron showed exceptional academic ability at a very young age – he picked up books and began to read on his own when he was just two years old. He especially excels in mathematics and loves to read about science. His second grade teacher gave him a high-school level benchmark math test and he passed it! Soon after, Ron received a perfect score on his State of California standardized STAR test (a 600 in both the math and verbal categories!) and was accelerated into the fourth grade; he went on to win the spelling bee and earned 13 A plusses last year. In addition to practicing and performing piano, Ron plays percussion and piano in the Inland Valley Symphony’s Attacca youth ensemble. He also plays electric bass in a band he formed with his brothers: “The McCarthys.“ When the weather is good, you’ll find Ron on the tennis court, or perhaps just soaking up a good book wherever he can find a quiet place to read. Ron came to Yiyi’s studio in March 2012. He has participated in numerous events and has made tremendous progress. The most notable achievements to date includes receiving a trophy for the Sonatina Festival, Gold Medal at the Temecula Music Festival, Superior Plus rating at the National Piano Guild Auditions and getting to the Regional Festival in the Southern California Junior Bach Festival. Ron has one hour lessons every week at the studio. During the summer months, he started working on Music Theory for Certificate of Merit, and has almost completed everything from Levels 1-5. 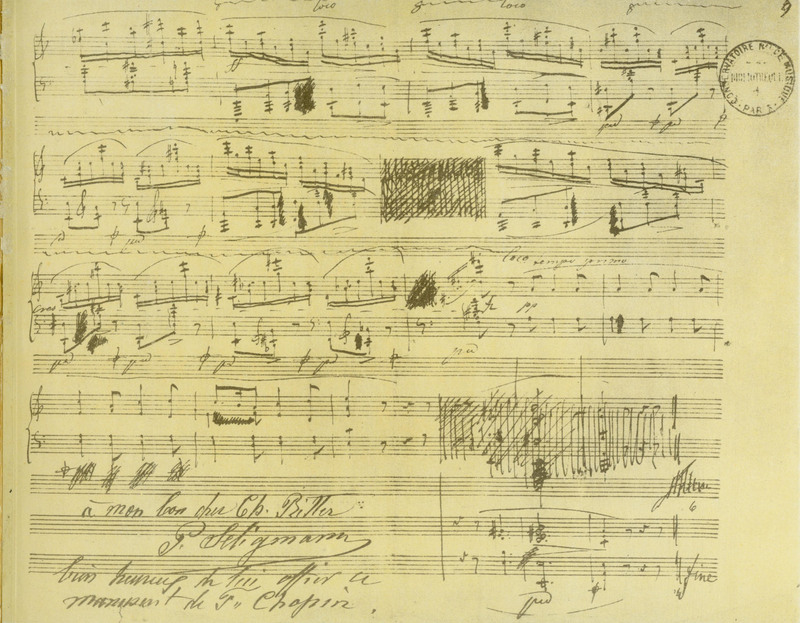 He is currently working on eight books (from left to right in the picture): Sonatina Album, Chopin Waltzes, Bach Little Preludes and Fugues, Bartok Album, Khachaturian Sonatina, Schumann Album for the Young, Debussy Album, and Tchaikovsky Album for the Young. I am always impressed with how well he is prepared for his lessons. 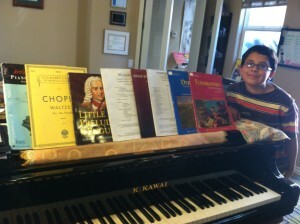 He is a very talented and hardworking student, and I am so proud to have him in the studio!